COPD is the overall term used to describe a variety of illnesses, including emphesyma, chronic bronchitis and chronic obstructive pulmonary disease (or chronic obstructive airways disease). People with COPD have permanently damaged lungs and find it difficult to breathe most of the time. COPD usually affects people over the age of 40. Approximately 900,000 people in the UK have been diagnosed with COPD in the UK but more recent research suggests that COPD may be hugely under-diagnosed - based on reported symptoms, over 3.2 million people may have the condition (that’s as many as one in ten people over 40). COPD is closely linked with smoking in many cases and the changes in smoking habits several decades ago mean than although COPD is more common among men, cases are rising three times as fast among women. COPD is the sixth most common cause of death in England and Wales, causing over 30,000 deaths a year. But its estimated that by 2020 it will be the 3rd biggest killer in the world – it’s the only major cause of death that has actually increased significantly in recent years. The damage to the lungs that results in COPD is gradual, which is why most people are over 40 by the time symptoms begin. Research suggests that it takes about 20 years from onset of initial damage to the lung until it is actually diagnosed. An early morning cough, often called a smoker's cough, is common and produces a lot of phlegm. Wheezing, chest tightness and difficulty breathing are often noticed first. People may find themselves short of breath when doing very little or even when they're just sitting down. It becomes harder and harder to do any exercise until even crossing a room becomes impossible. These symptoms are usually worse in winter, with recurrent lung infections adding to the problem. If severe, these recurrent infections and worsening of lung function (known as exacerbations) may prove fatal - ten per cent of those admitted to hospital with an exacerbation will die in hospital and as many as 40 per cent will die within a year. COPD impairs quality of life, by preventing people with the condition from socialising and enjoying their hobbies. It also makes many feel frustrated and angry about not being able to do the things they want to. Smoking is to blame for COPD in the majority of cases. The chemicals in cigarette smoke causes inflammation and fibrosis or scarring in the lungs and destroy the elasticity that allows the lungs to expand and contract as we breathe. 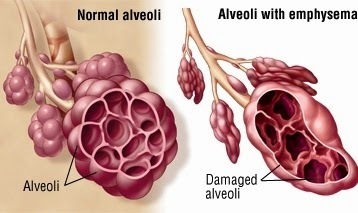 It also damages the alveoli, the tiny air sacs at the end of the airways from which oxygen is absorbed into the bloodstream. Other causes include occupational exposure to dusts, indoor pollution from wood-burning and coal-burning stoves, air pollution and certain inherited diseases. For example, a minority of people have a rare inherited form of emphysema caused by a lack of the protein known as alpha-1-antitrypsin. The diseases collectively known as COPD - chronic bronchitis, emphysema and chronic obstructive airways disease - are now understood to be aspects of the same problem: a narrowing of the airways, which obstructs the flow of air in and out of the lungs, making it difficult to breathe. Unlike asthma, where narrowing of the airways can be reversed, the narrowing in COPD is progressive and not fully reversible. In chronic bronchitis, for example, excess mucus is made in the airways so people have a lot of phlegm and cough all the time. This mucus also narrows the airways. In emphysema, the air sacs are left over-inflated when air becomes trapped in them and their elastic fibres are destroyed. Small holes also develop in their walls, leaving them unable to work properly. As a result the person chest may become expanded and barrel-like. It's not possible to cure COPD, but the damage can be slowed - this is the main aim of treatment. Treatment also aims to improve symptoms like breathlessness, increase the amount of exercise a person can manage, reduce the risk of exacerbations, hospital admissions and complications, and generally improve their quality of life. By far the best way to do this is to stop smoking. It's also vital to avoid other people's smoke. Exercising as much as you're able to helps keep the lungs (and heart) strong and builds self-confidence. Pulmonary rehabilitation programmes help improve symptoms and increase exercise capacity. Physiotherapy helps to clear mucus from the lungs and most people with COPD are taught exercises they can do every day to help themselves. Medicines that make the airways wider so it's easier to breathe can be given through an inhaler or as tablets. Another important target for medicines is to reduce the inflammation in the lungs in COPD - the best drugs for this are steroids which are also usually given through an inhaler type of device. Steam inhalation and humidifying rooms can also help breathing by loosening mucus. Medication is available that helps to thin mucus so it's easier to cough up. When lung infections arise, it's important they're treated quickly with antibiotics. Recurrent or severe chest infections often need hospital treatment. When COPD is very severe, oxygen can be used at home. It's vital that people with COPD are vaccinated against flu every year (usually in autumn) and against the most common cause of pneumonia, the pneumococcus bacteria, when advised. It’s also vital to avoid lung infections and further damage to the lungs. Eating a healthy diet and drinking enough liquid is essential.